Prototype: German Federal Railroad (DB) type ABnrzb 772.1 "City Bahn" commuter car, 1st/2nd class, with a cafeteria compartment (car number: 50 80 31-34 025-2), type ABnrzb 772.1 "City Bahn" commuter car, 1st/2nd class, (car number: 50 80 31-34 013-8), and type BDnrzf 784 "City Bahn" commuter cab control car (car number: 50 80 82-34 295-9). Model: The cars have close coupler mechanisms. Interior lighting can be installed in the cars (cab control car excluded). The cab control car has automatic white headlights and red marker lights that change over with the direction of travel and will work in analog and digital operation. In digital operation, they can be controlled with the built-in DCC/SX function decoder. Total length over the buffers 495 mm / 19-1/2". 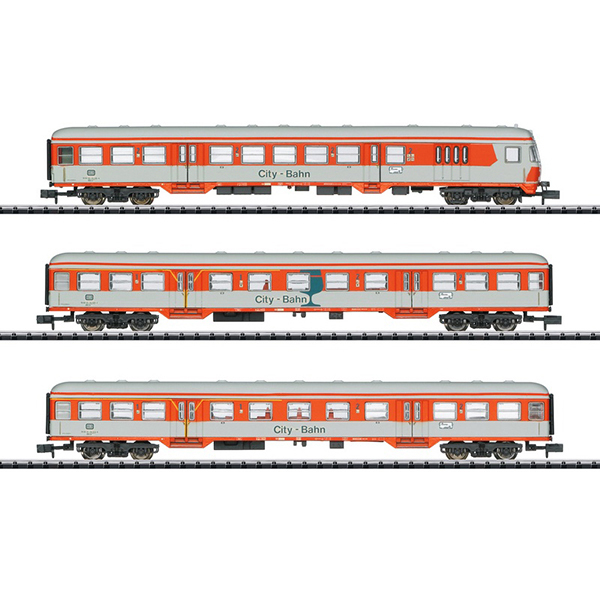 You can make a complete train with the car, 2nd class, available as item number 15475, and the class 218 diesel locomotive, available as item number 16280 as well as the 15985 baggage car. City Bahn Branch lines have always been problem children for the German railroad. In 1984, the German Federal Railroad took a new approach to increase the attractiveness of service on little used routes. The project went under the name "City-Bahn" and initially one route was selected for this service: Cologne – Gummersbach. "Silberlinge" / "Silver Coins" commuter cars were used as rolling stock and were rebuilt to the latest standard at that time. A train café was set up in one of the cars and the exterior of these trains was borrowed from the paint scheme for the S-Bahn in the Rhine/Ruhr area. The paint scheme for the locomotives was adapted to that of the trains in order to achieve a high level of recognition for the "City-Bahn" product. Class 218 diesels were used on the route Cologne – Gummersbach. The railroad was able to register a clear increase in passengers thanks to the "City-Bahn", and this increase was the result of the dense service at regular intervals. Without a doubt, the "City-Bahn" concept kept rail service alive on routes threatened with abandonment until it was replaced by its successor, the "Stadt-Express" or "City Express".